I'd like to hold it in my arms and keep it company. ~ Billy Davis et al. Harmony is a word which originates in the Greek ἁρμονία (harmonía), meaning "joint, agreement, concord" and is commonly used to denote forms of mathematical, musical or social concord and accord. O Plato! O Pythagoras! ages ago you heard these harmonies, surprised these moments of inward ecstasy, — knew these divine transports! If music thus carries us to heaven, it is because music is harmony, harmony is perfection, perfection is our dream, and our dream is heaven. Henri-Frédéric Amiel, Journal Intime (1882), entry for 17 March 1870. Ancient belief in a cosmos composed of spheres, producing music as angels guided them through the heavens, was still fluorishing in Elizabethan times. ...There is a good deal more to Pythagorean musical theory than celestial harmony. Besides the music of the celestial spheres (musica mundana), two other varieties of music were distinguished: the sound of instruments...(musica instrumentalis), and the continuous unheard music that emanated from the human body (musica humana), which arises from a resonance between the body and the soul. ...In the medieval world, the status of music is revealed by its position within the Quadrivium—the fourfold curriculum—alongside arithmetic, geometry, and astronomy. Medieval students... believed all forms of harmony to derive from a common source. Before Boethius' studies in the ninth century, the idea of musical harmony was not considered independently of wider matters of celestial or ethical harmony. And hear them echo through the hills "Ah, peace throughout the land." Billy Davis (working with Bill Backer, Roger Cook, and Roger Greenway) in "I'd Like to Teach the World to Sing" - Video of The New Seekers rendition at YouTube (with lyrics). A battle line occurs at these critical points in time. The heaven born leader must fight the onslaught with vigor and courage. Yet, no person alone can avenge a malevolent enemy. A grain of sand cannot consider itself a beachfront nor can a single drop of rain claim to be a raging river. However, when all the forces combine in harmony, then rocks crumble into dust, the earth shakes, and mountains move. Virtue is harmony, and health, and universal good, and God; on which account everything owes its existence and consistency to harmony. Diogenes Laërtius reporting on the doctrines of followers of Pythagoras, Lives and Opinions of Eminent Philosophers, as translated by C. D. Yonge (1853), Book 8: Pythagoras and the Pythagoreans. Relativity does set limits on what humans can ultimately do. But the universe is not required to be in perfect harmony with human aspirations. Carl Sagan, Cosmos (1980) p. 201. There is a spirit in man and in the world working always against the thing that destroys and lays waste. Always he must know that the contradictions of life are not final or ultimate; he must distinguish between failure and a many-sided awareness so that he will not mistake conformity for harmony, uniformity for synthesis. He will know that for all men to be alike is the death of life in man, and yet perceive harmony that transcends all diversities and in which diversity finds its richness and significance. Howard Thurman, The Search For Common Ground : An Inquiry Into The Basis Of Man's Experience Of Community (1971), p. 6. Each and every master, regardless of the era or the place, heard the call and attained harmony with heaven and earth. There are many paths leading to the top of Mount Fuji, but there is only one summit — love. Morihei Ueshiba, as quoted in You Can Save the Earth: 7 Reasons Why and 7 Simple Ways, a Philosophy for the Future (2008) by Hatherleigh, Sean K. Smith, and Andrew Flach, p. 92. My temper leads me to peace and harmony with all men; and it is peculiarly my wish to avoid any personal feuds or dissensions with those, who are embarked in the same great national interest with myself, as every difference of this kind in its consequence must be very injurious. George Washington, in a letter to Major-General Gates (24 February 1778); published in The Writings of George Washington (1890) edited by Worthington Chauncey Ford, p. 368. 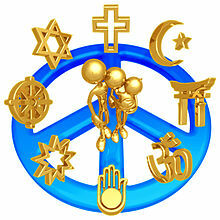 Observe good faith and justice towards all Nations; cultivate peace and harmony with all. Religion and Morality enjoin this conduct; and can it be, that good policy does not equally enjoin it?